There can't be too many things in life that are better than being a pilot! You get paid to fly, you travel for free, and you get to skip all the waiting around in an airport! The only thing we could think that would be better is if you were a pilot in a crazier version of reality! Not like a futuristic version that has you flying through space (Although, that would be amazing!). No, think of an alternate reality where you could be a steampunk pilot! 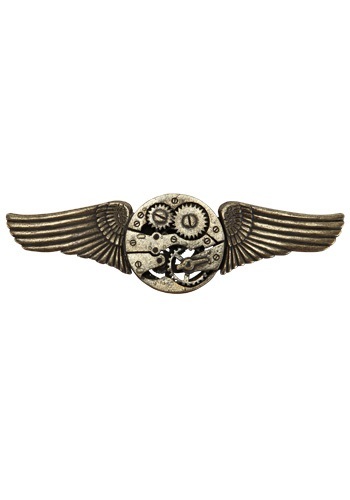 With this Antique Gear Wing Pin, you could be manning the cockpit of some insanely geared-out and steam-powered flying machine. Through the infamous London Fogs you would go and burst out of the dark smog into the clear blue skies, quite the wonder it would be. Now, before you would be allowed to fly any crazy contraptions off into the horizon, you will need the proper qualifications. We're sorry to inform you that we can't help out with that... but we can certainly make you appear to have the correct certifications! No one will second guess your flying skills when they see this winged steampunk pin on the lapel of your 19th century pilot outfit. Check out the rest of our Steampunk accessories and really make everyone wonder if they've been transported to an alternate reality this Halloween.